Pune recorded a marginal one per cent growth in property values in Jan-Mar 2015 with maximum housing demand in peripheral and affordable regions. Improving infrastructure kept the market steady this quarter. 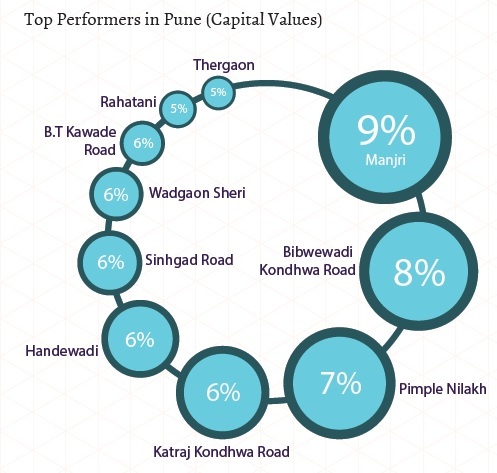 Similar to several other cities, Pune too saw a record number of unsold units in the market. This resulted in a considerable drop in the number of new launches. 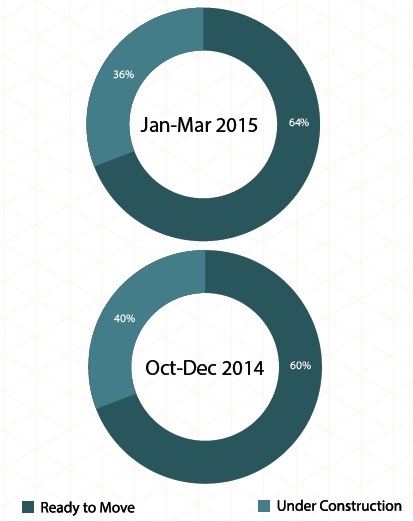 New residential launches in the city dropped by over 30 per cent between Oct-Dec 2014 and Jan-Mar 2015. Availability of affordable properties, high scope of negotiation and presence of IT industry attracting expats kept the realty market intact despite low sale volumes. Out of the total localities tracked, almost 70 per cent recorded positive price movement. Of these, around 20 per cent recorded a price growth between five to nine per cent - the highest in the city. In order to keep customer sentiments afloat, Pune Municipal Corporation (PMC) rejected the proposal to increase civic taxes by 18 per cent and Pimpri Chinchwad Municipal Corporation (PCMC) refused to increase property taxes in Jan-Mar 2015. Policies favouring industrial and infrastructural development in Pimpri Chinchwad belt resulted in increased housing demand in the region. Rising property costs in the mainland led to real estate development in suburban areas such as Wagholi, Sinhgad Road and Baner. While the IT industry continued to fuel demand for residential apartments, the city recorded maximum preference in the affordable and mid-income segments priced up to Rs 60 lakh. Manjri witnessed maximum price appreciation of nine per cent this quarter. Proximity to IT hubs and comparative affordability to Hadapsar and Kharadi were seen as major growth stimulators. Both Hadapsar and Kharadi recorded an insignificant price movement of two per cent each. 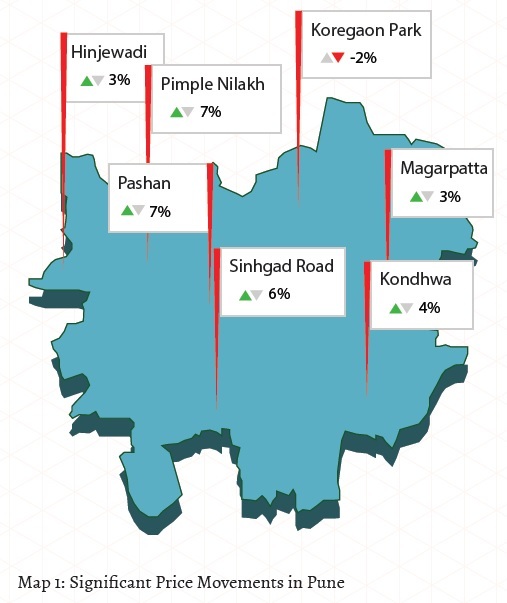 Positive buyer sentiments owing to well-developed social infrastructure and connectivity pushed property prices on Bibwewadi-Kondhwa Road, Katraj-Kondhwa Road and Pimple Nilakh by six to eight per cent. Availability of properties in an affordable price bracket also pushed housing demand on Katraj-Kondhwa Road. Located in the peripheries of East Pune, Handewadi attracted several IT professionals from Magarpata and SP Infocity due to presence of affordable prices. Rates in Handewadi went up by six per cent this quarter. Increasing industrial activity in the Pimpri Chinchwad belt, availability of land parcels and new residential projects at low prices pushed demand, and hence, prices in Rahatani and Thergaon by five per cent each. Lacking social amenities, Pisoli and Lulla Nagar recorded a dip in property prices to the tune of five and 10 per cent, respectively. Mundhawa lost its buyers to the comparatively affordable Manjri, thereby recording a seven per cent decline. High scope of negotiation in the market led to a drop in ask rates in the premium localities such as Viman Nagar, Koregaon Park and Model Colony by two to four per cent. 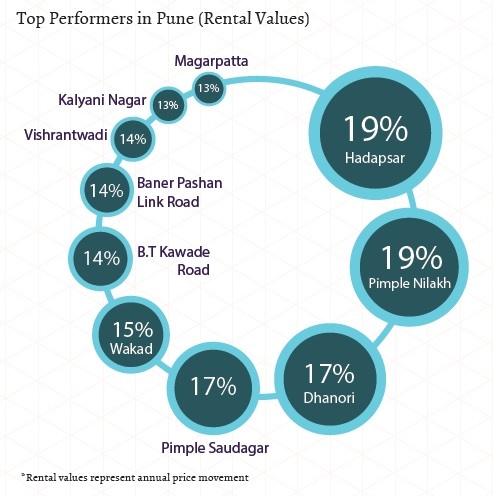 Driven by professionals from IT and manufacturing industries and global firms, Pune’s rental market recorded an eight per cent average growth in Jan-Mar 2014 in comparison to the previous quarter. With PMC focussing on improving civic amenities in Hadapsar, the locality garnered interest from IT professionals working in Magarpatta and Kharadi. In the last one year, rental values in Hadapsar have gone up by almost 20 per cent. Pimple Nilak, too, recorded a similar hike owing to its proximity to the premium locality, Aundh. As of now, rental rates in both Aundh and Pimple Nilakh are almost similar, however, the latter offers a better lifestyle owing to newer developments and open areas. Due to affordable rental options, considerable rental demand shifted to areas such as Dhanori, Pimple Saudagar and Wakad. Rental rates in these areas went up by 15-17 per cent in one year. For professionals working in the Hinjewadi IT hub in West Pune, Baner and Wakad are the most promising rental destinations. Comparative affordability to Baner drove majority demand to Wakad. Baner recorded a moderate hike in rental values by seven per cent. Residential establishments across the Baner-Pashan Link Road saw a 14 per cent spike in rental values due to affordable rental inventory. A standard 2BHK apartment in this area is available for Rs 15,000-20,000 per month. The predominant IT industry has led to a healthy demand from migrants moving in the city. With 2BHK units being the most supplied, Pune saw the maximum share of its inventory in the price bracket of Rs 60 lakh-Rs 1 crore. Supply of various property types such as apartments, builder floors and independent houses/villas in Pune remained unchanged in the last three months. 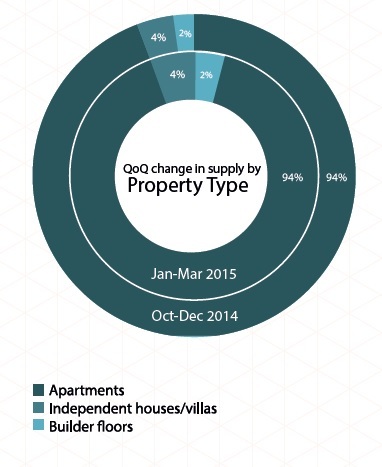 Residential apartments continued to be the most supplied category, across the city. It made up 94 per cent of the entire inventory, leaving limited scope for other property types. Independent houses/villas recorded four per cent supply. Maximum demand for these units was seen from the Pune and Mumbai based businessmen, NRIs and top-management of the IT industry. The concept of builder floors continued to remain subdued and recorded the least supply - two per cent. Supply of various budget ranges in the city saw slight variations in the Jan-Mar 2015 quarter, as compared to the Oct-Dec 2014 quarter. Similar to the previous quarter, properties in the high-income segment (Rs 60 lakh - Rs 1 crore) were the most supplied amongst all other budget ranges in the city. However, its supply dropped by three per cent and reached 31 per cent in this quarter, as compared to 34 per cent in the previous quarter. Majority of the properties (70 per cent) in the high-income category were available as ready-to-move-in units. The supply was five per cent higher than the previous quarter. Affordable housing category (properties priced up to Rs 40 lakh) was the next most supplied in Pune. Its supply remained unchanged over the last three months and stood at 24 per cent. About 55 per cent of these units were ready-to-move-in. 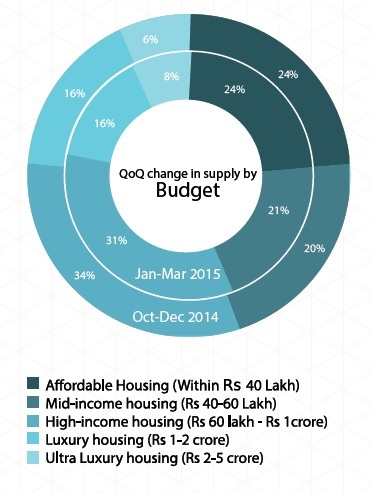 Mid-income housing category (Rs 40-60 lakh) recorded 21 per cent supply in Jan-Mar 2015, marginally higher than Oct-Dec 2014. 65 per cent of these units were ready-to-move-in, 10 per cent higher than the previous quarter. Supply for the luxury housing segment (Rs 1-2 crore) remained stagnant at 16 per cent since the last quarter. However, the ultra-luxury category of Rs 2-5 crore recorded an increase in supply by two per cent. Its supply went up from six per cent in Oct-Dec 2014 to eight per cent in Jan-Mar 2015. Similar to the previous quarter, almost 30 per cent of the luxury homes and 40 per cent of the ultra-luxury homes were under-construction in this quarter. 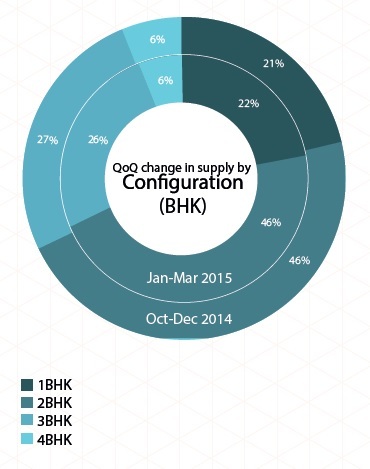 Mid-sized homes configured as 2BHK units continued to record maximum demand, hence supply. Similar to the previous quarter, it made up close to half of the total market share (46 per cent supply). The next most supplied configuration in Pune was 3BHK. Its supply recorded an insignificant drop (one per cent) from the previous quarter and stood at 26 per cent this quarter. Instead, supply for 1BHK units rose by a similar amount and stood at 22 per cent, as compared to 21 per cent in Oct-Dec 2014. Larger homes configured as 4BHK units recorded least supply in the city. Its availability continued to remain at six per cent in this quarter as well. Higher ticket size and less takers led to developers focussing on other configurations more. The city recorded an increased supply of ready-to-move-in properties. Overall, supply of these units went up by four per cent and stood at 64 per cent as compared to 60 per cent in the previous quarter. Supply of under-construction properties dropped to 36 per cent this quarter, from 40 per cent, indicating several project deliveries and slow rate of new launches in Pune. Out of the total ready-to-move-in properties, maximum (34 per cent) were available in the budget range of Rs 60 lakh – 1 crore (high-income housing). This was followed by mid-income housing (Rs 40-60 lakh) and affordable housing (within Rs 40 lakh) which made up 21 per cent and 20 per cent of the total ready-to-move-in properties, respectively. Out of the total under construction properties, maximum were available in the affordable housing category (within Rs 40 lakh), followed by high-income bracket (Rs 60 lakh - Rs 1 crore). In case of property configurations, 2BHK units captured the maximum share of both ready-to-move-in and under-construction units.